The City Palace in Jaipur was once the seat of kings as it was from here that they ruled the region. One of the best tourist spots in the city, the City Palace is a vast complex and includes several buildings, courtyards and gardens. Two of the main palaces in the complex are the Chandra Mahal and the Mubarak Mahal. The architecture is a fusion of Indian, Mughal, Rajput and even European styles and you can see the grandeur of the fusion in every nook and corner of the palace. The red and pink sand stone in which it is built adds a special beauty to the palace. The decorated gateways add elegance and magnificence to the structure. The City Palace of Jaipur is a great example of how design, art and creativity can be blended to form an exquisite symbol. 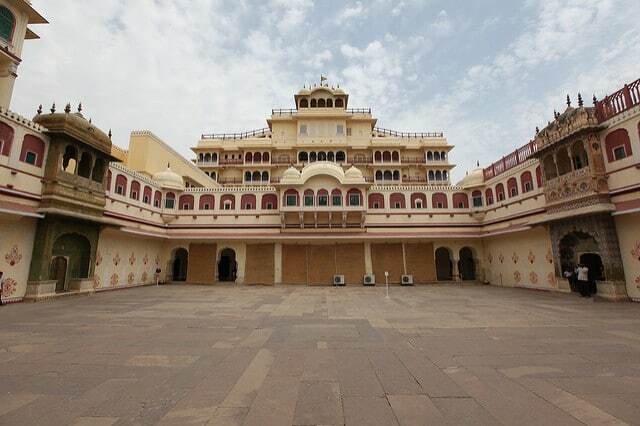 The City Palace was built by Sawai Jai Singh who is also known as the founder of Jaipur City. The credit of Hawa Mahal and Jantar Mantar also goes to him. Though the main architects behind the magnificent City Palace were Vidyadhar Bhattacharya and Sir Samuel Swinton Jacob, Maharaja Sawai Jai Singh also contributed to the architectural design of the palace. There are three main gates to the palace which are Tripolia Gate, Virendra Pol and Udai Pol. There are also four smaller gates in the third courtyard, which are believed to represent four seasons. The peacock or the Mor Gate represents the autumn season and there are 3D models of peacocks at the gate giving it a magical view. The Lotus Gate was to symbolise the summer season while the Leheriya Gate for the spring season. The Rose Gate is the winter gate. All these gates are decorated likewise and it is a sheer delight to just look at these gates, and entering it is a bliss. Today, there are two parts of the palace, one which is opened for the public and also has a museum, and the other for the residence of the royal family, the descendants who live here even now. One of the famous items in the City Palace are two silver jars which have found place in the Guinness Book of World Records as the largest silver vessels in the world. Apart from Mubarak Mahal and the Chandra Mahal, there are Pritam Niwas Chowk, Diwan-i-Aam, Diwan-i-Khas, Bhaggi Khana, Maharani Palace and the Govind Dev Ji Temple, an 18th century structure. 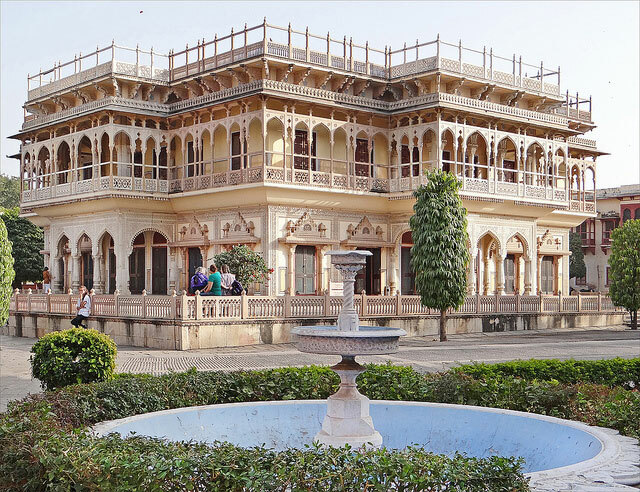 The Chandra Mahal, Maharani Palace and the Bhaggi Khana have been converted into museums. Mubarak Mahal is a museum dedicated to royal textiles. You can see the dresses worn by queens and kings. The clothes worn by Maharaja Sawai Madho Singh I is quite a treat to the eyes as he was believed to have weighed 250 kgs. Baggi Khana is a place dedicated to chariots and coaches. The two prime attractions are the chariot which was used to carry the royal deity and a European Cab which was gifted to Maharaja Sawai Ram Singh II by Queen Victoria herself. The Silehkhana has a great and fine collection of weapons and handguns used during the time. There are swords, knives, arrows, axes, and so on. The personal weapons of the kings are also displayed here. It is a vast complex and you will have to walk a lot. So, dress accordingly. Good walking shoes or flat footwear are preferred. Drinking water facility is available. So, there is no need to carry water bottles. The trusts have undertaken care to see to it that the City Palace complex is disabled friendly. Enquire for guides at the entrance. Also, find more about tickets as you may have to purchase individual tickets for the palace and the museums. Entry Fees: They may charge differently for the palace premises and for the museum visits. Currently, Indians are charged Rs. 100 to view the exterior spaces and for the museum, Rs. 130 is charged. For foreigners, it is 500 and Rs. 900. You may also buy a composite ticket. Guides are available in different languages. Avail the services of licensed guides at the City Palace. The fees for the guides depend on the number of persons. September to February when the sun is not too harsh in the desert state. The City Palace is easily accessible from Jaipur city. You can take a cab, bus or auto rickshaw to reach the palace. A visit to City Palace means a visit to a bygone era that was full of richness, aura and wonder. There are many reasons to visit the palace, first, the amazing architecture, the intricate works, the amazing courtyards, and of course, the awe-inspiring museums. If you are going to Jaipur only for a day, then the City Palace is a must visit. A mere visit to the place will fill in you respect for cultural heritage, amazement for the rulers, a curiosity about the life of queens and paramours and of course, a new-gain respect for everything that is history and heritage.